In November, we celebrate National Home Care and Family Caregivers Month, observances that are central to FirstLight Home Care. Throughout the month, our FirstLight weekly blog will focus on providing the tips, resources, peace of mind and inspiration that so many family caregivers need. If you are or have been a family caregiver, we invite you to comment and share your rewarding experiences caring for a loved one, as well as the struggles you have faced throughout your caregiving journey. The family caregiver – a person who provides regular physical, emotional or household support to a loved one who is elderly, disabled, ill or recovering – has become a mainstay in the United States. More than 40 million Americans provide care for a loved one who needs assistance. On average, family caregivers spend more than 24 hours per week providing care. And that’s just scratching the surface. The overall impact of caregiving responsibilities on families is profound. Each November, we observe National Home Care Month and National Family Caregivers Month. It’s easy to see why an entire month is set aside to recognize the importance of home care and the role of the family caregiver. It’s fitting that these two observances are celebrated simultaneously each year. Home care providers and family caregivers have a truly meaningful relationship. 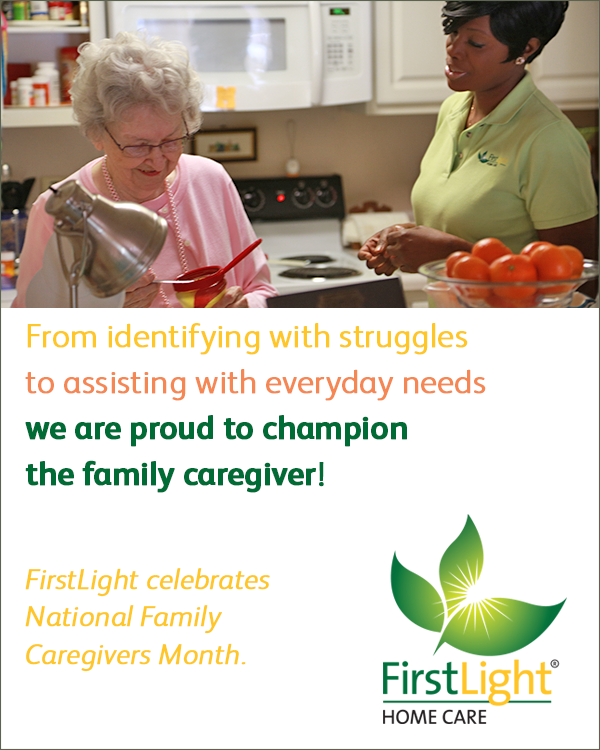 Throughout the month of November – and always – FirstLight Home Care honors the individuals who take on the labor of love that is family caregiving. You are humble heroes. And we champion you! Are you a family caregiver? What does being a caregiver mean to you? Here are some additional blog posts we thought you’d like to read. Enjoy!